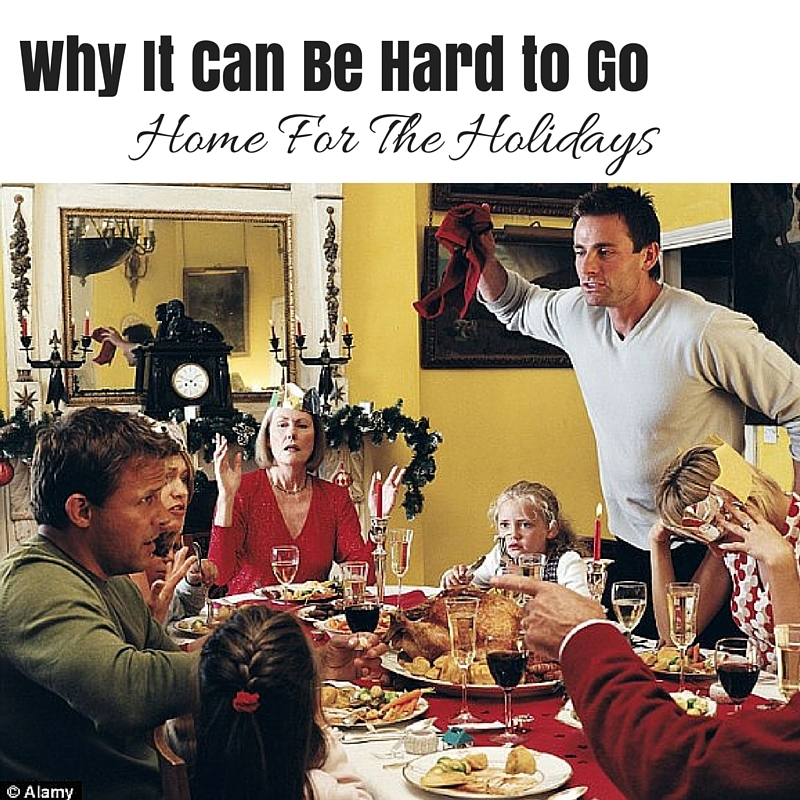 When you think about celebrating the holidays with your extended family, what emotions come to mind? I hope you are filled with joyful anticipation. But I know there are many who dread these events. The mention of Thanksgiving can send some into a panic as they remember past holidays in which a small space was overfilled with aging parents, adult siblings and spouses, and a gaggle of grandchildren running amok. But it’s not the number of people in the room that brings anxiety. It is what remains unspoken, what has been unresolved, and what happens between the moments when the photos are taken. Anger, resentment, loneliness while in a crowd: these are what make holiday gatherings painful for so many. Add to this the taunting of our emotions by Hallmark’s beautiful images of the family we’ve always yearned to be a part of. No matter that the families depicted on television are fantasy or, at best, show the greatest-moments highlights of a well-adjusted family who practices the art of grace daily. Most people cry when they see these commercials, and I believe many are crying tears of sorrow. This most beautiful time of year can become something quite unbeautiful as we struggle to keep it all in, project our best selves, and wait for it to be over so we can go back to our own homes, our own routines, our own lives. But I believe God wants more for us. What if He wants to fulfill His promise for a life of hope, joy, connectedness, boldness, and the many other gifts He has promised us? What if He wants us to change things not just for ourselves, but for our children, our grandchildren, and every generation beyond? Secrets of Your Family Tree, written by a team of Christian counselors, (including Dr. John Townsend and Dr. Henry Cloud of the Boundaries series of books) offers amazing insight into the inner workings and motivations of the family system in which we grew up. This is the place we all learned how to be a family, and that learning has impacted us—positively or negatively–as we’ve gone on to create our own families. The authors list the almost universal rules that govern the dysfunctional family: Don’t talk. Don’t trust. Don’t feel. They explain how some families operate to protect the family unit’s supposed image while completely missing the child’s natural purpose of learning to become an adult. As grown ups, these same children may have distortions of God, distortions of themselves, and distortions of others. They may believe God doesn’t like our questions and hates our failures. They may feel not good enough or they may believe they are better than those around them. They may believe others despise them if they disagree and they may become people-pleasers or people-avoiders. Imagine a handful of these same people gathering around one table for a Thanksgiving meal. Those who have worked through many of these problems in our individual lives can still be miserable when we find ourselves in an enclosed space for a number of hours or even days with our family of origin. We may feel that we no longer fit. We probably do not share the same parenting style. We probably do not share the same communication style. We may not be able to talk openly about how we have changed. Going home is like going back to the past, and it is more painful to exist in this place the second time through. Secrets of Your Family Tree is not an easy book to process, because it will shine a light on what has been hidden. But we were meant for more than just making it through our lives. With its prompting reflection questions, this book offers us a chance to seek understanding of our families and ourselves, and–more importantly–of the person God sees when He looks at us. It offers us a chance to stop the dysfunction that has likely been passed down the branches of our family tree for multiple generations. It’s a chance for redemption. A chance for forgiveness. A chance for a fresh start–not just for us, but for all generations who follow us. I am 45, I lost my mother in 1978 (New Years Eve). I can’t ever celebrate New Year. I am a labor & delivery nurse, so I almost always work the night shift. I am fine 363 days of the year, but my mom’s birthday & New Years are hard. If I had $1 for every idiot who has made insensitive comments, I would be so rich. Examples “Your Mom died so long ago, I am sure it doesn’t bother you anymore, you probably quit missing her years ago, my & she were divorced, so I get to hear from him, if had done this or that, she would not have died. I just laugh, I also have had Crohn’s disease since I was a teen and the only way to survive Crohns is to laugh. I am not sure what part I can play in your ministry, attend a workshop or share my testimony. Let me know if I could help. Thanks for your reply to our blog and thanks for your willingness to help out with the Motherless Daughters Ministry. We have been serving women who have either lost or missed the nurturing care of a mother since the year 2000! It is such an awesome privilege to do this. The answer is yes to all of the ways you suggested. Yes you can be involved, yes you can attend a workshop and yes you can share your story/testimony. I would love to talk with you about how you could be involved in supporting the ministry. Please respond to my email and let me know how I can reach you. I also wanted to let you know about an upcoming Journey Retreat/Workshop for Motherless Daughters will be held in the Cincinnati area on June 9-12, 2016. It should be awesome! Information will be available in January about this.